What state and federal policies are spurring microgrid growth in the United States? Here’s an inventory from our latest Think Microgrid report, The Energy Efficient Microgrid, which examines grid-connected microgrids and companion technologies: combined heat and power (CHP) and district energy (DE). The Obama administration created one of the most significant milestones in the US CHP industry’s history when it announced a presidential goal to increase the resource 50 percent by 2020. The Department of Energy’s CHP Technical Assistance Partnerships (CHP TAPs) is focused on achieving the 40 GW goal. Save the equivalent of 1 percent of all energy use in the U.S. Emissions regulations also are likely to encourage more CHP in North America. ICF International estimates that 3.5 GW of CHP could be added to meet certain emissions targets. 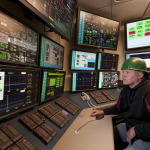 A study by the ACEEE found that potential for CHP to save 68 million MWh of energy by 2030. This 18 GW of avoided capacity could significantly reduce C02 emissions by averting the need for about 36 power plants, ACEEE said. The Clean Power Plan: Issued in June 2014 by the Environmental Protection Agency, it represents the nation’s first carbon dioxide restriction for existing power plants. States will determine their specific paths to reach the goal of a 30 percent reduction in C02 emissions by 2030. But the EPA offered four building blocks to reach the goal, including increasing end use energy efficiency; improving power plant heat rate; shifting from coal to natural gas; and expanding zero or low emitting generation. CHP district energy can fit bill in all four categories. Other jurisdictions have set voluntary targets for greenhouse gas reduction or reporting requirements. Ontario, for example, requires that facilities that emit more than 25,000 tons per year from certain sources report their emissions to the provincial government. The government says that the emissions reporting helps it in planning clean energy programs to reduce greenhouse gasses. Ontario launched a special program for CHP/DE in 4Q 2014. Other emissions regulations also may stimulate development of CHP/DE microgrids, such as EPA’s Boiler Maximum Achievable Control Technology regulations. ICF International says that the rule could increase CHP by 1.26 GW, as industrial and commercial facilities replace their older oil and coal-fired boilers. Additional policies promote CHP, such as state renewable or alternative portfolio standards that set energy efficiency goals or in some cases even CHP goals. The 2008 Green Communities Act in Massachusetts established an Alternative Energy Portfolio Standard to specifically support CHP. (See Appendix 3 for a complete list of CHP Policies and Incentives from the US EPA CHP Partnership.) The Ontario Power Authority is planning to support a series of CHP and district energy projects through its request for proposals process. Connecticut has conducted two solicitations for community-based microgrids, the California Energy Commission is offering $26.5 million in microgrid grants; and New Jersey established a $200 million fund for an Energy Resilience Bank to support deployment of assets like microgrids. 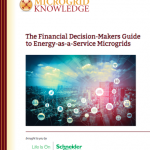 The Energy Efficient Microgrid: What Combined Heat & Power and District Energy Bring to the Microgrid Revolution is provided as a free download, courtesy of Solar Turbines and the International District Energy Association.